Once hacked, compromised organisations face huge barriers to rebuilding customer trust and brand reputation. OSE detects & alerts to attacks on your critical systems as they occur so you can stop them before damage is done to your organisation's IP, brand and reputation with the ensuing loss of customer trust. OSE provides an audit of an attack listing what was changed, what it was before making it quick to resolve. OSE reporting helps with ISO 27000 compliance. OSE (Operating system Security Enforcer) implements your defined Security Policy which can either be an out of the box OSE standard or your personalised version. Collect and controll Logs and alarms, generated by OSE checkpoints. 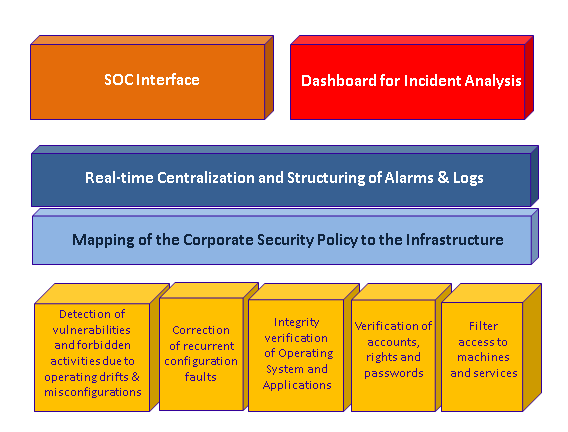 Monitor system security: dashboards and reports. 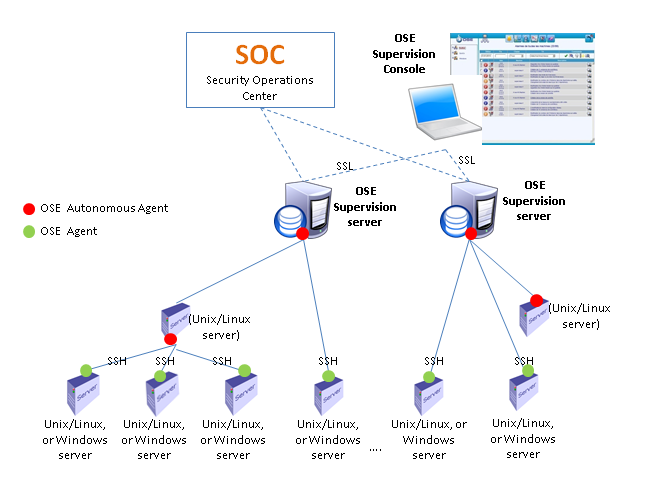 OSE Supervision Console: An administrative workstation with a web browser and an optional SOC Interface. OSE Supervision Server: a highly secured UNIX/Linux server with a web server dedicated to OSE, and restricted access to network services to ensure intrusion protection. The Autonomous OSE Agent is permanently located on a Unix/Linux server. It is persistent, even in case of network failure. It can also group a set of servers monitored by OSE Agents (see below). The OSE Agents pushed and managed on Unix/Linux and Windows servers via a SSH connection. Interface with external SOC tools.